322 pages | 6 B/W Illus. 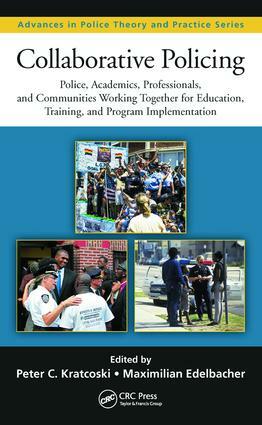 "The chapters in this book reveal that police education, training, and practices are now closely tied to collaboration between police, academics, professional practitioners, and community agencies, and such collaboration is described and evaluated." "The chapters in this book present genuinely comparative, theoretically informed, and experience-based collaborative programs to appraise and analyze the specific practical, theoretical, and psychological challenges of working together and the creative means to overcome those challenges." A collection of chapters authored by internationally known police leaders, academics, researchers, and professionals, Collaborative Policing focuses on the fact that the worlds of policing practice and research are moving closer. Using in-depth interviews with police and professionals who work with justice agencies as well as case studies demonstrating fruitful police–academic collaboration, it explores methods and programs for improving the quality of services provided by the police. Many police executives, in conjunction with citizens and political leaders, now define the missions of their agencies on the basis of research findings, practical experience, and projections of what policing will involve in the future. This book shows you not only that collaboration can occur, but that it can also enhance police service, which in turn improves the quality of life for the communities they serve. Its descriptions of police–academic cooperation provide you with valuable guidelines for designing programs to develop a better police force and a stronger community. Peter C. Kratcoski, PhD, is a professor emeritus and adjunct professor at Kent State University. He earned his PhD in sociology from Pennsylvania State University, University Park. He taught at the College of St. Thomas, St. Paul, Minnesota and at Pennsylvania State University before assuming the position of assistant professor of sociology at Kent State University in 1969. He retired as professor of criminal justice studies and chairman of the Department of Criminal Justice Studies at Kent State University in 1997. He has published many books, book chapters, and journal articles on juvenile delinquency, juvenile justice, international policing, and crime prevention. He is a member of the International Police Executive Symposium, the Society for Police and Criminal Psychology, and the Academy of Criminal Justice Sciences. Maximilian Edelbacher graduated from Vienna University (Mag. Jur.) and was Hofrat (Councilor) of the Federal Police of Austria. He served as the chief of the Major Crime Bureau and as an international expert for the Council of Europe, OSCE, and UNO. He also chaired the Austrian Antifraud Insurance Bureau and lectured at several universities, including the Vienna University of Economics and Business Administration, Danube University in Krems, and the Vienna University Department of Sociology. Edelbacher was appointed a special investigator of the AVUS Group on white-collar crime cases, as vice-president of the Vienna Liaison Office, of the Academic Council on the United Nations, and as a director of the International Police Executive Symposium (IPES). He is the author of a number of books and journal articles. Presenting volumes that focus on the nexus between research and practice, the Advances in Police Theory and Practice series is geared toward those practitioners and academics seeking to implement the latest innovations in policing from across the world. This series draws from an international community of experts who examine who the police are, what they do, and how they maintain order, administer laws, and serve their communities. The series eeditor encourages the contribution of works coauthored by police practitioners and researchers. Proposals for contributions to the series may be submitted to the series editor Dilip Das at dilipkd@aol.com.